This is a truly nutty and funny adaptation of the classic fairy tale, with a great, great role for a comic actor as the lead. Again, the Misdirected Theatre is involved, with Margaret, Ozzie, Larry, Cynthia, Jason and Warren the UPS guy all participating. This time, though, there's no waiting for the Misdirected Players to show up. Margaret and her troupe have formed their own company, the Theatre In A Trunk players, and they are fully prepared to tell the exciting story. After a bit of comic difficulty convincing Jason to take part--he's hiding in the audience--the players tell the story of the miller and his very, very pretty daughter who find themselves in the predicament of having to spin straw into gold for the haughty King who specializes in parodying show tunes. When a strange little man makes a deal to do the spinning--in payment for a number of things the miller's daughter has to offer, the story takes off. Ingenue Cynthia takes the role of the very, very pretty miller's daughter; Larry the stage hand plays her father, the miller; Jason reluctantly takes the role of the King; Margaret plays the hideously ugly castle wench; Warren the UPS guy tells the story, and Ozzie, the stage manager, gets the plum role of the little man who claims nobody in the kingdom knows his name. He is sadly mistaken. PHOTO FROM WORCESTER FOOTHILLS THEATRE. 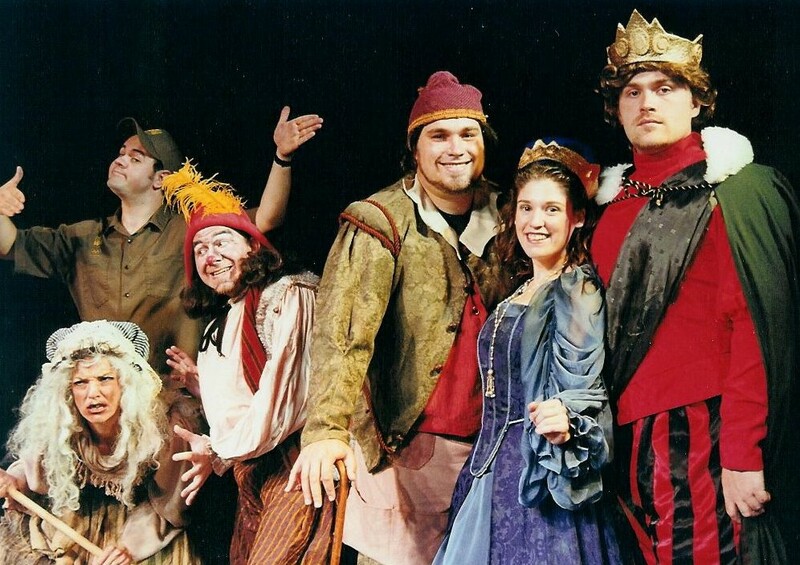 Same cast as ROBIN HOOD, THE UGLY DUCKLING and SNOW WHITE, again with six actors playing many roles.